We took a bit of a rest after last time's mud fest. But this Sunday was very looking very promising weather wise, so we set out to do section 15. The start of section 15 is easy for us to reach, at only 11 stops on the Overground to Hatch End. We left the station on the way to the start, but after a few hundred meters we realised we forgot to take a photo of the LOOP section at the station. Unfortunately, it's on the other side of the barriers so Morag went back in to snap a photo. With that out of the way, we started towards the start of the section yet again, while spotting some KLM houses in an antique shop for sale. Just after starting the section, we had to battle through some jungle. After a bit we gave up, and took a much easier stroll at the edge of a nearby field. 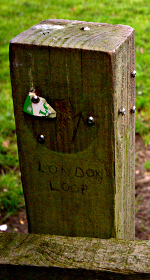 Although technically not quite the LOOP, it sure beat getting stung by nettles and scratched by brambles. A make-shift LOOP sign told us where to go. We crossed through a field, and under the West Coast Main Line towards Little Oxhey Road. After following this road for a bit we crossed a major road into a field with scary looking Keep Out signs on the right. Not sure why we would be at that side of the massively broken barb wire fence anyway, as there were only nettles and brambles. We walked past the Grims Dyke Golf Club and came upon a marker explaining about Grim's Ditch (or Grim's Dyke), an ancient earthwork. We turned into the woods—infested with mosquitoes as my legs now show—along the ditch. I made a small navigational error and instead of going past Gilbert's Lake, we ended up at his mansion! The house was not built for W.S. Gilbert, but he lived there the last two decades of his life. 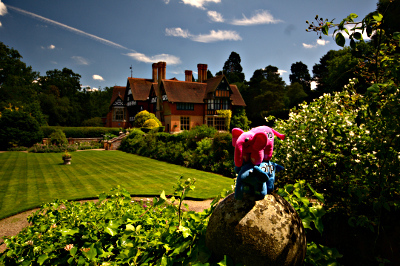 The elephpants thought it beautiful too. We walked back along the lake and through some woods with only a little bit of mud. When coming out of the woods we hit to top of Grim's Dyke with excellent views over central London. Not much after that, we stopped for a quick pint at The Case is Altered, probably the pub with the weirdest name I've been at. After the pint we went back into the woods for a bit and after a while we crossed into Bentley Priory Nature Reserve, where all the paths were nicely concreted—a big change from all the mud of the last sections. At the other end I found a unmapped postbox. Then we crossed into Stanmore Common and walked around the rugby club to come upon another bit of jungle. More stingy nettles attacked my legs while we walked past the Royal National Orthopedic Hospital. 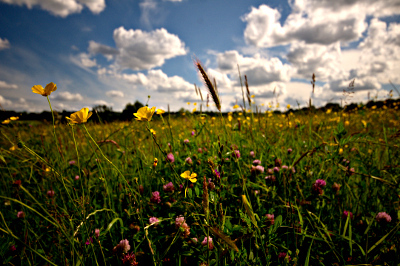 Out of the jungle we crossed a field filled with buttercups and clover in bloom. We spend some time taking photos. After the nice field, we crossed under the M1 and had to walk a little bit alongside Elstree Road. Probably the least pleasant part of the walk. However, there was another pub, The Fishery. Some snacks, and two local bitters later we continued to finish the section. There was a leisurely walk along the Aldenham Reservoir at the Aldenham Country Park. The last bit of the walk went over fields and over the Elstree Golf Club to end at Elstree & Borehamwood station. The weather was mostly sunny with a few clouds at the start, and a few more at the finish. It was 24°C and not nearly as humid as we feared. We took nearly four hours for this section's 15.5km.